Crocodopolis, Dr. Love And Throne of Egypt New Slots To Be Launched At Casino Rewards Casinos This November. We've got news of 3 new Microgaming games for you to check out in a casino lobby from 4 November - new video slots are added to the portfolio of over 450 games on offer. 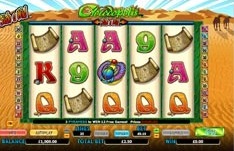 You can play the new games in most Microgaming casinos or try them at Casino Action with $/€/£1,250 welcome bonus. In the meantime, make sure you take advantage of one of the latest games at CasinoRewards member casinos for the chance to earn yourself DoublePoints. This 25 line 5 reel game introduces a brand new feature which is sure to take you one step closer to the hearty jackpot on offer! Slide a Wild™ is a feature where a player has manual control over the placement and behaviour of certain symbols, in this case the wild symbol. A game where YOU have total control and POWER to WIN! Enjoy the experience that Crocodopolis brings, there is no other slot like it on the net today! 20 line and 5 reel game has a comical, zany hospital theme with a charming and fun Doctor that you just can’t help but fall in love with! 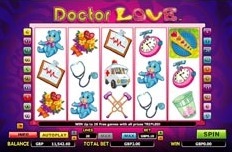 Dr. Love features bright and funky graphics, animations and sounds with a frequent hitting feature to keep you prescribed to the max! 15 or 20 Free Spins are won when 3, 4 or 5 scattered LOVE METER symbols appear respectively. 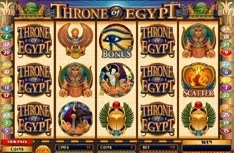 This majestic slots game features intricate graphics and animations of Egyptian royalty. When the Bonus Round is triggered by 3 Eye of Horus Scatter symbols on reels 2, 3 and 4, the player is taken through to 3 different chambers, passed the Anubis guards and allowed to pick from the Royal treasury, where jewelled Scarabs and Eagles await. Finding the Golden key will allow you to progress through to the final Bonus level – The King’s Chamber where 3 stunning Princesses await, bearing gifts for you to choose. Not only are the icons on fire in this great retro rehash of a classic game, but the jackpot thermometer is also about to catch fire if it gets any hotter! Make sure you’re the one to clear it out by taking advantage of this great offer from CasinoRewards. Play Retro Reels – Extreme Heat slot machine this month at any of the CasinoRewards online casinos and you will be credited with Double Points. You must have a real player account and have purchased a minimum (or total of) $/€/£100.00 in Real Account casino chips during the month. Player must meet the casino minimum deposit requirements depending on their casino of choice.